Advanced Mode allows you to install and manage more than one instance of TM1Connect on the same server. This mode also allows you to install and configure multiple web sites, applications and application pools. 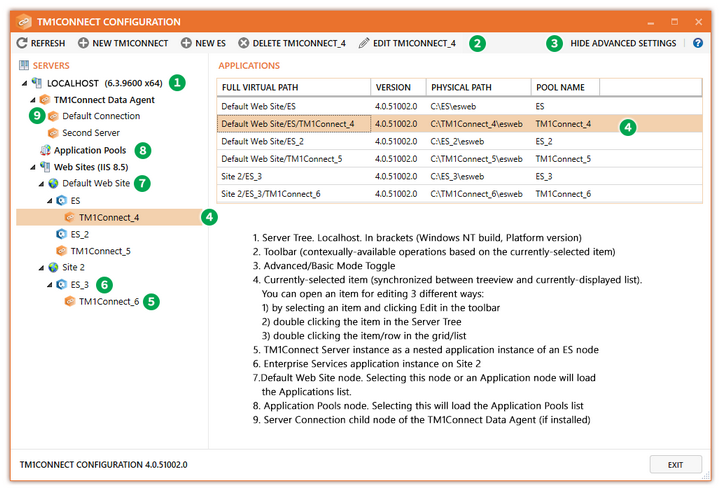 In addition, if you have Enterprise Services also installed, you can manage and add Server instances of both TM1Connect and Enterprise Services from a single configuration utility. 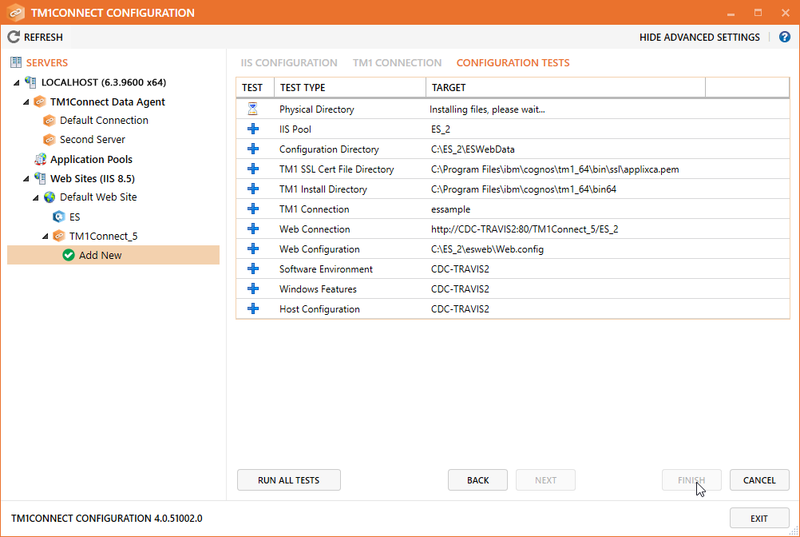 Key to navigating in Advanced Mode is understanding the different node types found in the Server Tree, shown in the user interface below, and the operations available when each different type is selected. 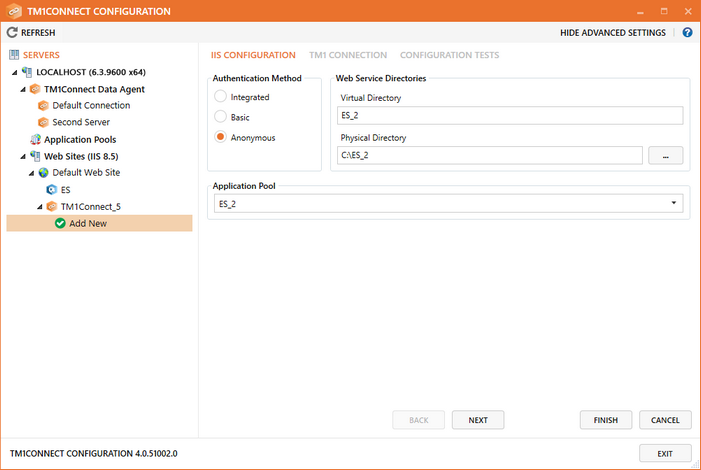 When the process is complete, the Server Tree will replace the Add New icon/node with the icon of the application type you created. Once you select Edit, the application will open in the Application editor for editing. The process to edit an application is the same as creating a new application, with the exception of the IIS Virtual Directory and IIS Physical Directory, both of which are readonly when you are editing. When you are done with your edits, click Finish to complete editing, and after the vertification tests have completed, click Close to return to the Applications list. 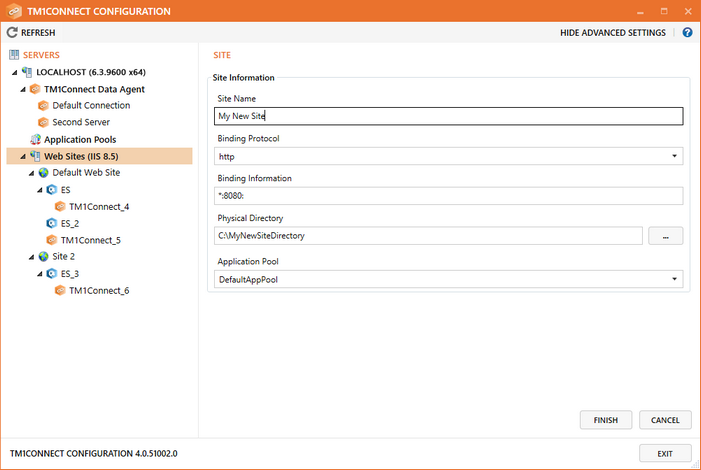 To delete an application, select it in the Server Tree or in the Applications list, and select Delete [App Name]. 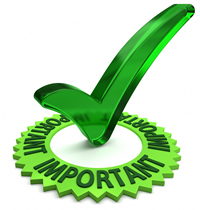 Use caution as deleting an application will delete any sub-applications in its tree, delete all the physical files from disk, and delete any Application pools not used by any other server applications. The delete actions, like other delete actions, cannot be undone. Populate the fields with your desired information, and click Finish to create the site. The editor will close, the Server Tree will update, and you will be redirected back to the Applications list. 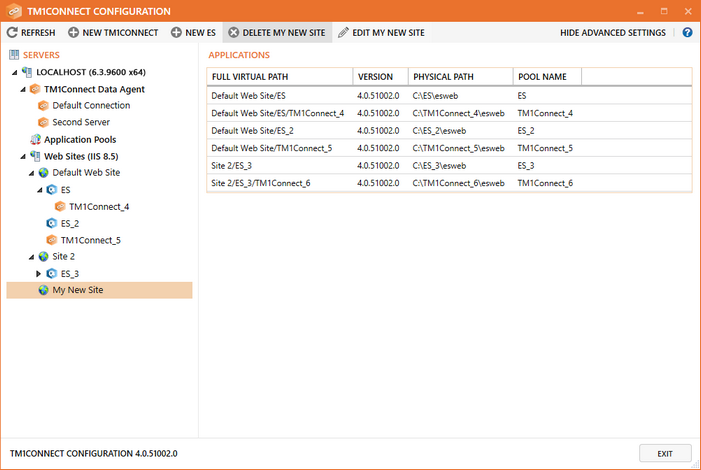 After clicking Edit, the Site Editor will open and will be populated with the Site's information. Make any edits (including the Site Name) and click Finish to save the site. Your changes will be saved, the Server Tree will be updated if you renamed the site, and you will be redirected back the Applications list. In the Server Tree, select the Site to be deleted. In the toolbar, click Delete [SiteName] as shown below. Clicking to Delete a Site will by default delete all Applications and Application Pools beneath it. Be very careful as this operation cannot be undone. This will open the Application Pool editor. 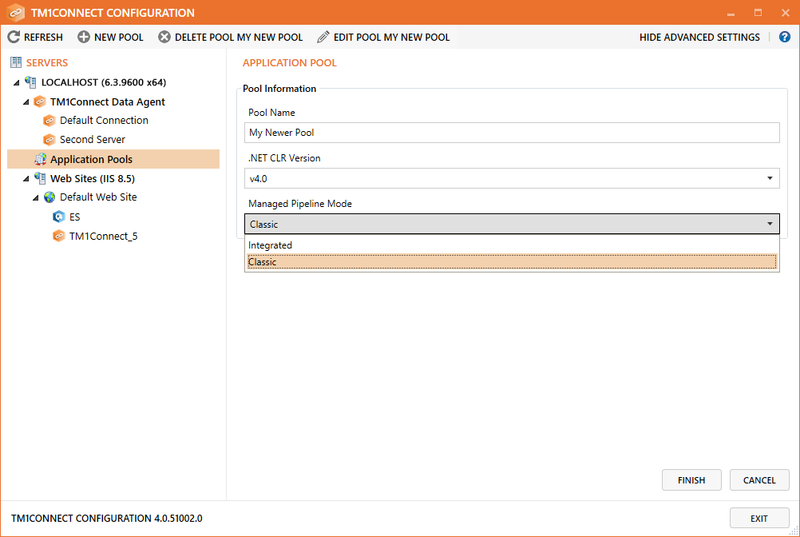 Type your new Pool Name, select any options, and click Finish to save the Pool. After clicking Finish, your Pool will be saved, you will be redirected back to the Application Pools list, and the new pool will be selected by default. 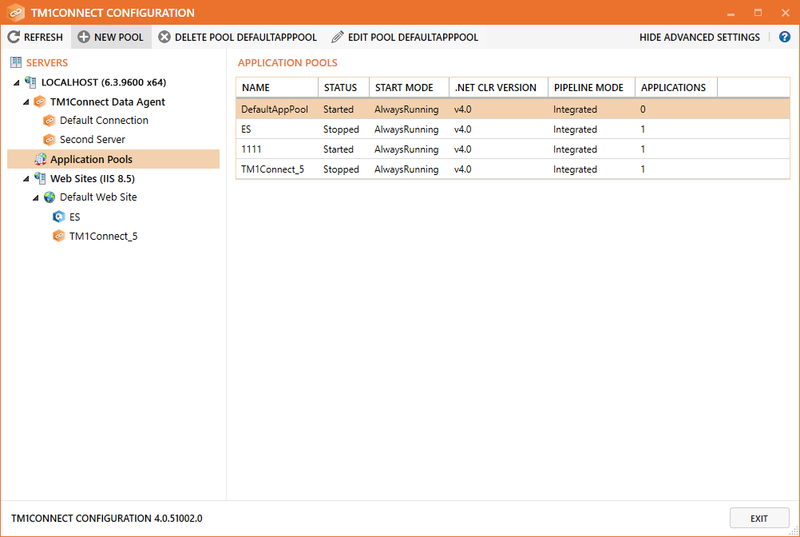 This will open the Application Pool editor (shown below) where you can edit the Application Pool's properties. Click Finish to save your changes. 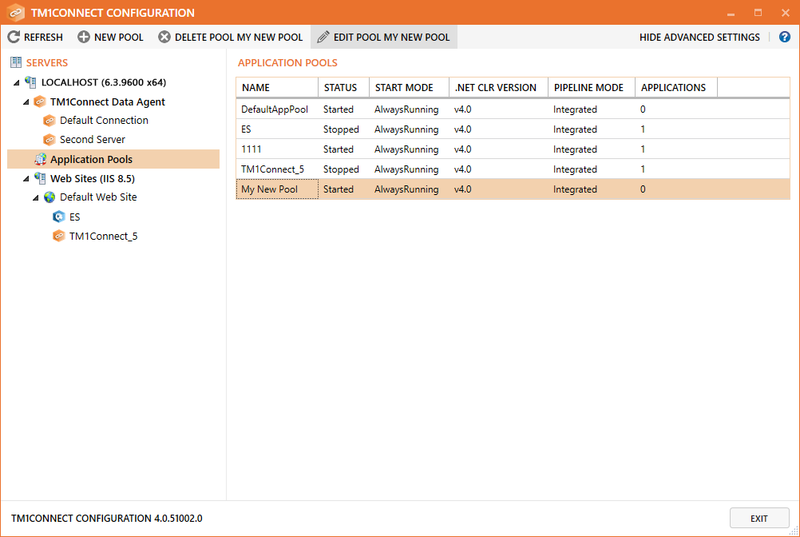 Note how the item's edited properties are automatically updated in the list and how the toolbar buttons have been updated with the new Pool name. It is also helpful to note that you can only edit a Pool's name if it is not in use by any Applications. You can view the number of Applications using any given pool by the rightmost column in the Application Pools list. 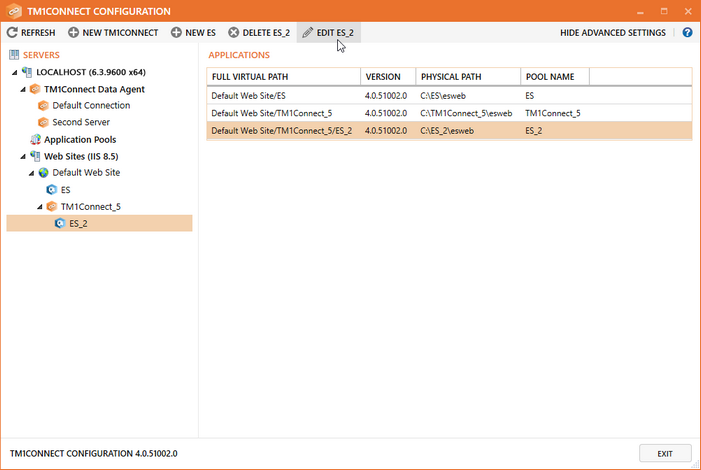 To delete an Application Pool, first select Application Pools in the Server Tree. 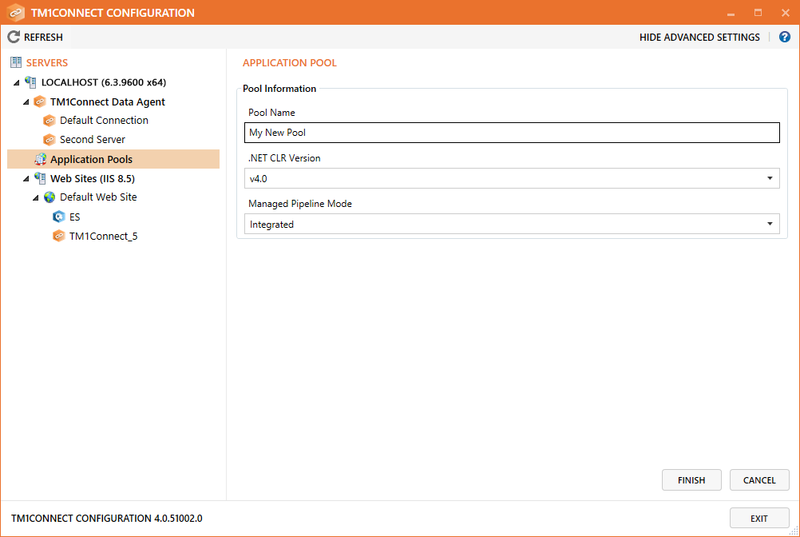 The Application Pools list will open in the content pane. Select the pool you wish to delete in the list, and click Delete [Pool Name], as shown below. You can only delete an Application Pool that is not in use by any Applications.